Mahler, D. L., Weber, M. G., Wagner, C. E., and Ingram, T. 2017. Pattern and process in the comparative study of convergent evolution. The American Naturalist. In press. PDF of author’s copy. Ingram, T., A. Harrison, D. L. Mahler, M. R. Castañeda, R. E. Glor, A. Herrel, Y. E. Stuart, and J. B. Losos. 2016. Comparative tests of the role of dewlap size in Anolis lizard speciation. Proceedings of the Royal Society B 283:20162199. PDF of author’s copy. Medina, I., J. B. Losos, and D. L. Mahler. 2016. 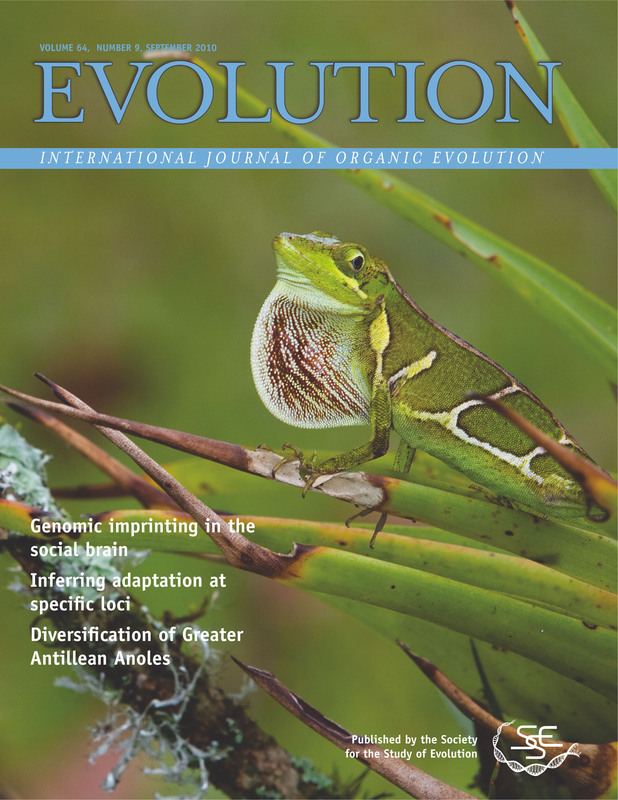 Evolution of dorsal pattern variation in Greater Antillean Anolis lizards. Biological Journal of the Linnean Society. DOI:10.1111/bij.12881 PDF of author’s copy. Mahler, D. L., S. M. Lambert, A. J. Geneva, J. Ng, S. B. Hedges, J. B. Losos, and R. E. Glor. 2016. 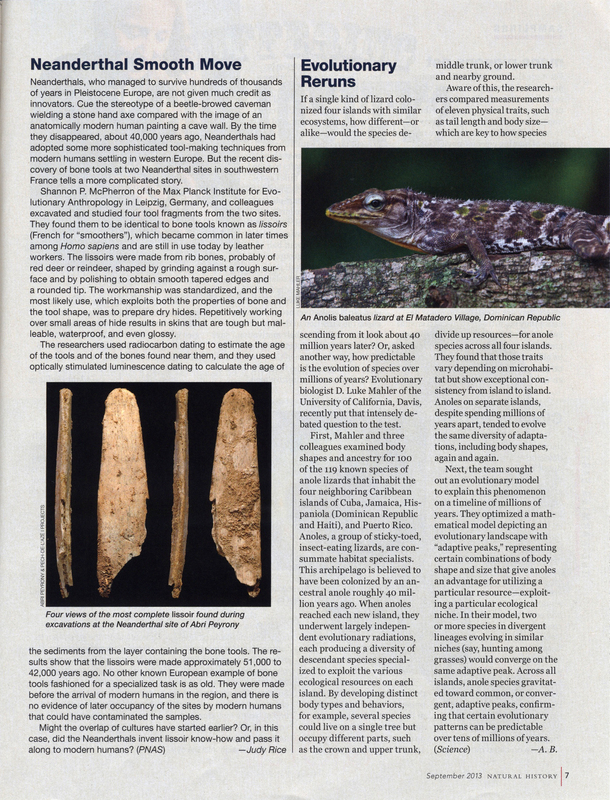 Discovery of a giant chameleon-like lizard (Anolis) on Hispaniola and its significance to understanding replicated adaptive radiations. The American Naturalist. 188:357-364. PDF of author’s copy, Supplementary Materials. See media coverage of this work by CBC News, Toronto Star, and Quanta Magazine. Sherratt, E., M. del R. Castañeda, M. Garwood, D. L. Mahler, T. J. Sanger, A. Herrel, K. de Queiroz, J. B. Losos. 2015. Amber fossils demonstrate deep-time stability of Caribbean lizard communities. Proceedings of the National Academy of Sciences. 112:9961-9966. Link to online article or PDF of author’s copy. See media coverage of this work by the New York Times, Nature, Smithsonian Science News, ABC Science, Phys.Org, Discovery News, and Huffington Post. Helmus, M. R., D. L. Mahler, and J. B. Losos. 2014. 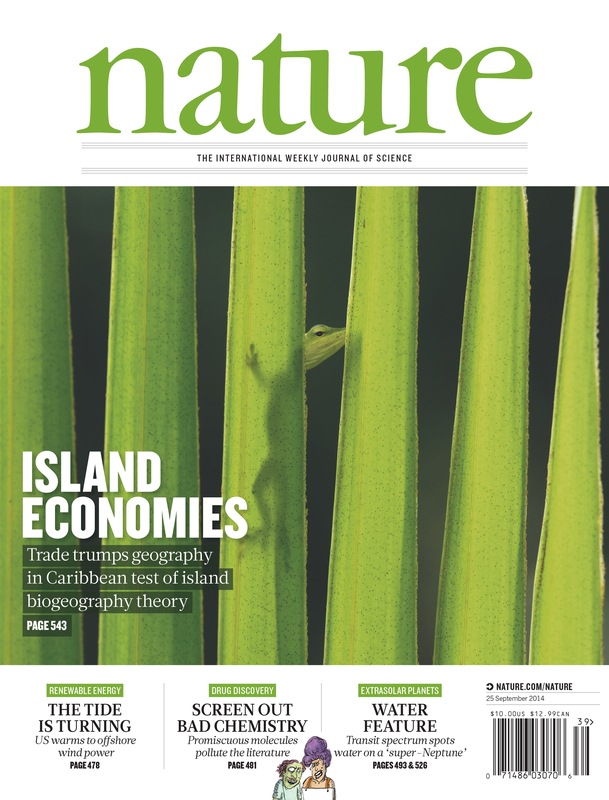 Island biogeography in the Anthropocene. Nature. 513:543-546. Link to online article or PDF of author’s copy. See media coverage of this work by the New York Times, National Geographic, Nature News, Science, Science News, Phys.Org, Scitable, Mongabay, Conservation Magazine, Pacific Standard, Quanta, the Harvard Gazette, and Wired. Mahler, D. L., T. Ingram, L. J. Revell, and J. B. Losos. 2013. 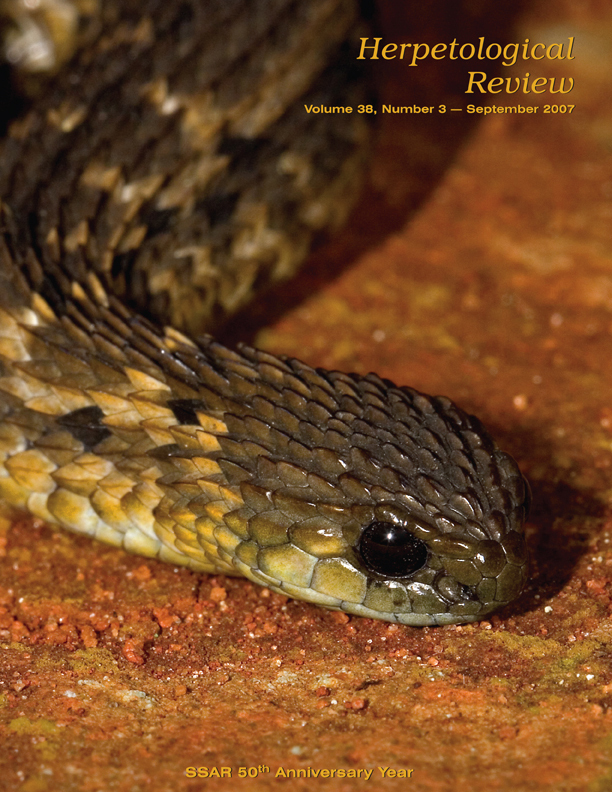 Exceptional convergence on the macroevolutionary landscape in island lizard radiations. Science 341:292-295. Full Text, PDF of author’s copy, Supplementary Materials. Check out media coverage of this work by National Geographic (here and here), Natural History Magazine, LiveScience, two German radio shows (here and here), the Los Angeles Times, Phys.Org, and NBC. Also, this paper was recommended by Faculty of 1000. Lambert, S. M., A. J. Geneva, D. L. Mahler, and R. E. Glor. 2013. Using genomic data to revisit a classic example of reproductive character displacement in Haitian Anolis lizards. Molecular Ecology 22:3981-3995. PDF, Supplementary Materials. See also Molecular Ecology’s Perspective piece on the article.